What is this product used for: Certifect for Dogs provides complete flea and tick protection by killing adult fleas and ticks rapidly and destroying the flea life cycle. It is a long-lasting flea and tick monthly preventative for dogs only, 8 weeks of age or older and weighing at least 5 pounds, and begins to kill ticks within 6 hours of application. It also detaches ticks when applied to a dog with a pre-existing infestation. In addition, it kills chewing lice and aids in the control of chewing lice and sarcoptic mange infestations. How this product should be used: Certifect for Dogs comes in a dual chamber pipette, fipronil and (S)-methoprene are contained in one chamber and amitraz in the other. The pipette is designed to dispense all three ingredients simultaneously. Certifect for Dogs should be applied once a month to two spots, on your dog?s neck at the base of the skull and between the shoulder blades where he or she cannot lick. 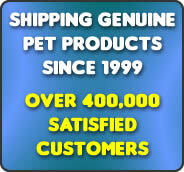 Certifect for Dogs is safe for use on breeding, pregnant, or nursing dogs. What are the side effects: Temporary lethargy and itching may occur. If signs persist after a few days of application, contact a veterinarian immediately. DO NOT use on dogs diagnosed with diabetes or heart problems. Contact a veterinarian before using on dogs that are medicated, debilitated, aged or obese. Certain medications can interact with pesticides. Amitraz is a monoamine oxidase inhibitor (MAOI); therefore, people taking MAOI-containing medication, or who are diabetic must take particular care when handling this product. What special precautions are there: Harmful if swallowed. Causes moderate eye irritations. Avoid contact with eyes or clothing. Wash thoroughly with soap and water- after handling and before eating, drinking, chewing gum, using tobacco or using the toilet. Prolonged or frequently repeated skin contact may cause allergic reactions in the some individuals. In the event of an overdose: Contact your veterinarian or veterinary emergency room. How should I store this product: Store unused product in original container in a cool, dry place, away from heat or open flame and out of the reach of animals and children. Availability: Certifect for Dogs is a non-prescription (OTC) product.